1988-04-02. New. Ships with Tracking Number! INTERNATIONAL WORLDWIDE Shipping available. Buy with confidence, excellent customer service! McClelland & Stewart, 1988-09-17. Hardcover. Used:Good. 1989-04-01. New. Ships with Tracking Number! INTERNATIONAL WORLDWIDE Shipping available. Buy with confidence, excellent customer service! The Easton Press, 1990-01-01. Hardcover. Used:Good. 2001-06-01. New. Ships with Tracking Number! INTERNATIONAL WORLDWIDE Shipping available. Buy with confidence, excellent customer service! Norwalk, Conn.: Easton Press, 1990. Leather Bound Nautical Library. Bound in gilt decorated navy blue leather, still in unopened Publisher's shrink wrap, raised bands on spine, all edges gilt, silk moire endpapers, silk ribbon page marker intact, with Publisher's slips laid-in. NEW.. Hard Cover. New. 8vo - over 7¾" - 9¾" tall. Book. 2000-01-05. New. Ships with Tracking Number! INTERNATIONAL WORLDWIDE Shipping available. Buy with confidence, excellent customer service! Viking Adult. Hardcover. 0670824917 New Condition *** Right Off the Shelf | Ships within 2 Business Days ~~~ Customer Service Is Our Top Priority! - Thank you for LOOKING :-) . New. The Lyons Press, 2000-08-01. Paperback. Used:Good. Viking Adult. Hardcover. 0670824917 . New. Viking Adult, 1988-11-01. Hardcover. Used:Good. Anchor Canada. PAPERBACK. 0385658451 New Condition. . New. Penguin Books. PAPERBACK. 014011680X New Condition. . New. The Lyons Press. PAPERBACK. 1585741167 New Condition. . New. Penguin Books. PAPERBACK. 0140126546 New Condition. . New. 1989-05-03. Good. Ships with Tracking Number! INTERNATIONAL WORLDWIDE Shipping available. May not contain Access Codes or Supplements. May be ex-library. Shipping & Handling by region. Buy with confidence, excellent customer service! 2000-01-05. Good. Ships with Tracking Number! INTERNATIONAL WORLDWIDE Shipping available. May not contain Access Codes or Supplements. May be ex-library. Shipping & Handling by region. Buy with confidence, excellent customer service! McClelland & Stewart, 1988. Very large, heavy, sturdy book, quality red cloth with embossed compass at bottom front right, very bright gilt lettering on spine, first two pages in shades of blue with portraits, two-page map, 672 pages. DJ glossy with abstract color image of dark blue sky, purple and red sun, light blue ice on front, spine and back. DJ and book, both As New.. 2d Ptg.. Cloth. As New/As New. 1989-04-01. Good. Ships with Tracking Number! INTERNATIONAL WORLDWIDE Shipping available. May not contain Access Codes or Supplements. May be ex-library. Shipping & Handling by region. Buy with confidence, excellent customer service! Toronto, Ontario: Toronto, ON: McClelland and Stewart ( M&S ), 1988, 1st edition, First Printing, 1988. -----------hardcover, a Fine copy in a Fine dustjacket, looks new, signed by BERTON in the year of publication "To L__ Pierre Berton Merry Christmas '88", 617 pages, b&w illustrations, contents include: ONE: 1. John Barrow's obsession; 2. The Croker Mountains; 3. Winter Harbour; 4. Fame, fortune, and frustration; 5. Innuee and kabloonas; TWO: 1. Franklin's Folly; 2. Miss Porden's core of steel; 3. Fury Beach; 4. The silken flag; 5. Treadmill to the Pole; THREE: 1. Endless winter; 2. The indomitable Jane; 3. Enter the Honourable Company; 4. Prison warden; 5. A matter of honour; 6. The Arctic puzzle; FOUR: 1. The lost ships; 2. Arctic Fever; 3. The American presence; 4. The crusaders; 5. The dutiful warmth of a son; FIVE: 1. Grasping at straws; 2. "A French officer will never hang back"; 3. The ambitions of Robert McClure; 4. The Passage at last; 5. Mercy Bay; SIX: 1. The spirit rappers; 2. Searching for the searchers; 3. The blue devils; 4. Ships abandoned; 5. Relics of the lost; SEVEN: 1. The defectors; 2. Kalutunah; 3. Retreat; 4. The high cost of dawdling; 5. The polar idol; EIGHT: 1. A "weak and helpless woman"; 2. The cruise of the Fox; 3. the document at Victory Point; 4. Failed heroes; 5. The ultimate accolade; NINE: 1. The obsession of Charles Francis Hall; 2. The Open Polar Sea; 3. Frobisher Bay; 4. Execution; 5. Death by arsenic; 6. George Tyson's remarkable drift; TEN: 1. "The navy needs some action"; 2. The seeds of scurvy; 3. The scapegoat; ELEVEN: 1. The polar virus; 2. Abandoned; 3. No turning back; 4. Starvation winter; 5. The eleventh hour; TWELVE: 1. Nansen's drift; 2. Andrée's folly; 3. Peary's obsession; 4. Amundsen's triumph; THIRTEEN: 1. Nearest the Pole; 2. "Mine at last! "; 3. Dr. Cook's strange odyssey; 4. Cook versus Peary; 5. The end of the quest; AFTERWORD: The chart of immortality; Author's Note;Chronology; Bibliography; Index; -----"Scores of nineteenth-century expeditions battled savage cold, relentless ice and winter darkness in pursuit of two great prizes: the quest for the elusive Passage linking the Atlantic and the Pacific and the international race to reach the North Pole. Pierre Berton's #1 best-selling book brings to life the great explorers: the pious and ambitious Edward Parry, the flawed hero John Franklin, ruthless Robert Peary and the cool Norwegian Roald Amundsen. He also credits the Inuit, whose tracking and hunting skills saved the lives of the adventurers and their men countless times. These quests are peopled with remarkable figures full of passion and eccentricity. They include Charles Hall, an obscure printer who abandoned family and business to head to a frozen world of which he knew nothing; John Ross, whose naval career ended when he spotted a range of mountains that didn't exist; Frederick Cook, who faked reaching the North Pole; and Jane Franklin, who forced an expensive search for her missing husband upon a reluctant British government. Pierre Berton, who won his first Governor General's award for The Mysterious North, here again gives us an important and fascinating history that reads like a novel as he examines the historic events of the golden age of Arctic exploration." -----, any image directly beside this listing is the actual book and not a generic photo ///SIGNED///. Signed (see description). First Edition. Hard Cover. Fine (see description)/Fine (see description). Illus. by Walter Steffoff Cover Design . New York: Viking, 1988. First American Edition [stated]. First printing [stated]. Hardcover. Very good in very good dust jacket. Price clipped. Signed by previous owner. DJ has slight wear and soiling, with small edge wear. Minor scuffs on rear end pages.. xii, 13-672 p. Maps. Illustrations. Chronology. Bibliography. Index. Covering the entire period of exploration from the expedition of William Edward Perry in 1818 to that of Robert Peary in a single volume, Pierre Berton has written a revisionist history of the search for the Northwest passage and the North Pole. 1988-04-02. Good. Ships with Tracking Number! INTERNATIONAL WORLDWIDE Shipping available. May not contain Access Codes or Supplements. May be ex-library. Shipping & Handling by region. Buy with confidence, excellent customer service! Toronto: McClelland and Stewart [0-7710-1266-7] . (Hardcover) 672pp. Near fine in near fine dust jacket. Illustrated endpapers, maps, illustrations, chronolgy, bibliography, index. Locale: ; North Pole; North West Passage. (Arctic/Polar, Voyages and Travels). Anchor Canada, 2001-01-01. Paperback. Used:Good. Canada: McClelland & Stewart, 1988. 1st Edition . Hardcover. Fine/Fine. Used, hardcover, first edition, 1988. Condition: fine, jacket: fine. Because of heavy book weight an extra shipping charge may be required. Penguin Books. PAPERBACK. 014011680X Like New Condition. . Fine. Penguin Books. PAPERBACK. 0140126546 Like New Condition. . Fine. The Lyons Press. PAPERBACK. 1585741167 Like New Condition. . Fine. Anchor Canada. PAPERBACK. 0385658451 Like New Condition. . Fine. Penguin Books Canada, Limited, 1989-01-01. Paperback. Like New. Appears unread, minor shelf/edge wear. Gift inscription.. Unconditional money back guarantee. McClelland & Stewart, 1988. Book. Very Good. Hardcover. 1st Edition. hardback, thick 8vo, mild spotting and age-toning to closed page edges, a very good tightly bound copy ina well preserved dust wrapper, text unmarked and clean, 672pp. Penguin Publishing Group, 1988. First Edition THUS. Hardcover. Very Good. Disclaimer:A copy that has been read, but remains in excellent condition. Pages are intact and are not marred by notes or highlighting, but may contain a neat previous owner name. The spine remains undamaged. The dust jacket is missing. At ThriftBooks, our motto is: Read More, Spend Less.Dust jacket missing. First edition THUS. SIGNED and inscribed by the author. Minor shelf and handling wear, overall a clean solid copy with minimal signs of use. Binding is sound. Pages are intact and free of marks. Secure packaging for safe delivery. Boston: MHS. Near Fine. 1988. 1st THUS. hardcover. large 8vo . 121-287pp . Facsimile reprint of the 18th century original. Book is BLACK CLOTH, NOT 'stock image'. .
NY: Viking Press, 1988. 1st American edition; dj w/unclipped price; illustrated end papers; 672 clean, unmarked pages.. 1st. Hardcover. Near Fine/Near Fine. Illus. by Maps; b/w Illus. 8 vo. Toronto: McClelland and Stewart, 1988. First Edition First Printing . Paperback. Very Good/No Jacket. 8vo - over 7¾" - 9¾" tall. 13 ILLUSTRATIONS, 44 MAPS, Very good gray color pictorial trade paperback. Light wear, previous owner name inside. (1988), 8vo, xii, , 15-672pp. "Here for the FIRST time in a single volume, is the full and detailed saga of the nineteenth-century quest for two of the world's great geographical prizes..."
Viking Press, New York, 1988. First Edition. Softcover. Size: Octavo (standard book size). 672 pp. Binding is tight, spine fully intact. All edges clean, neat and free of foxing. Quantity Available: 1. Shipped Weight: 1-2 kilos. Category: Arctic & Antarctic; #58066; Pictures of this item not already displayed here available upon request. Inventory No: 32337. .
McClelland & Stewart 1988. First Edition, Super octavo hardcover (VG) in d/w (VG); all our specials have minimal description to keep listing them viable. They are at least reading copies, complete and in reasonable condition, but usually secondhand; frequently they are superior examples. Ordering more than one book will reduce your overall postage cost. The Lyons Press. Used - Good. Ships from the UK. Former Library book. Shows some signs of wear, and may have some markings on the inside. 100% Money Back Guarantee. Your purchase also supports literacy charities. Toronto: McClelland & Stewart, 1988 Near Fine in hardcover in Very Good + dustjacket. 25 by 18 cm. 672 pages. Red cover with gilt lettering on spine. Illustrated endpapers.Price clipped dustjacket (jagged). Contains some black and white illustrations from photographs. Bright, clean..
Canada: Anchor, 2001. Near Fine. Reprint. Trade paperback. 672pp. A single page creased, near fine. Toronto: McClelland & Stewart, 1988. Near Fine in hardcover in Very Good + dustjacket. 25 by 18 cm. 672 pages. Red cover with gilt lettering on spine. Illustrated endpapers. Light wear to edges of dustjacket. Contains some black and white illustrations from photographs. Bright, clean.. ISBN: 0771012667. ARCTIC REGIONS, Non-fiction, History, Canada, Canadian. Catalogs: Non-Fiction, History. New York: Penguin Books. Very Good with no dust jacket. 1989. 014011680X . The Quest for the North West Passage and the North Pole 1818-1909; 014011680X. .
Markham: A Penguin Books Canada Ltd/McClelland and Stewart Book, 1989. Light Creasing on Front, Rear Covers; Front, Rear Covers, Spine Lightly Chipped; Slight Yellowing Due to Age. 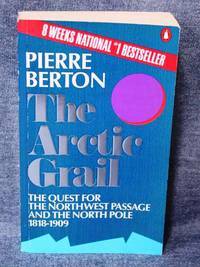 SYNOPSIS: In The Arctic Grail, Pierre Berton follows the paths forged by a handful of stubborn explorers, who risked life and limb in their quest to find the Northwest Passage. This quest is peopled with larger-than-life adventurers and with the remarkable Inuit, without whom Arctic exploration would not have been possible. Pierre Berton was born in 1920 and raised in the Yukon. He spent his early newspaper career in Vancouver, where at 21 he was the youngest city editor on any Canadian daily. He moved to Toronto in 1947 and at the age of 31 was named managing editor of Maclean's magazine. He was an associate editor and columnist at the Toronto Star from 1958 to 1962 and has written and hosted several national television programs. He is the author of thirty-four books and has received three Governor General's Awards for works of non-fiction. He is a Companion of the Order of Canada and a member of the Canadian News Hall of Fame.. First Thus 1st Printing. Mass Market Paperback. Fine. 12mo - over 6¾" - 7¾" tall.